I’m sure many of us desire to live a natural and whole life, free from disease — yet feel frustrated with what we come face-to-face with on a daily basis. We face many complexities with all the food choices, addictions, healthcare options, and environmental impacts impacting on our bodies. It can get quite overwhelming and confusing what it comes to the “proper diet,” which can lead us into frustration and despair. But wait a minute… I have fantastic news. You can use delicious, raw whole food for healing! I have taken the time to break down what it takes to heal naturally. You will not be overwhelmed because I will give you basic step-to-step instructions on how you can effectively accomplish this with or without adhering to a 100% raw food diet! So, please, if you are truly seeking empowerment in your own health and want to experience healing or simply feel energetic, please watch the YouTube video I have created. It is 27 minutes long, but worth it. Clear out your schedule, kick back, and learn my simple tactics. I assure you will not be disappointed! The procedure mentioned in the video above is exactly what the health institutes and many nutritionists do in order to help heal people from disease. I’ve met countless people who have healed from all sorts of degenerative diseases through using this method. You can take control of your health and experience healing! See Joshua’s testimony on how he has been healed from prostate and colon cancer naturally! This is only one amazing testimony and there have been others. There is an overwhelming effect of the cause of disease Americans are facing today. In this video you discovered that the real reason why people are becoming sicker by the day. People are becoming overly dependent upon drugs. People, dare I say, “trust” in doctors because they think it’s the best solution. Now, I’m not against the medical profession. I know that they are necessary when it comes to life threatening situations, but most of the diseases that people face are, in fact, preventable. When people go see doctors, symptoms are treated instead of discovering the cause. More and more elderly are facing dementia and Alzheimer’s disease at an astonishing rate. As I have indicated in the video, 1 of 3 elderly dies from this disease in the United States and there has been a baffled 68% increase in incidences of Alzheimer’s between the year 2000 and 2010! It Comes down to One Simple Thing — Eliminate Processed Foods & Use Whole Food for Healing! This is one of the main reasons why many diets work because they all share one thing in common…simply eliminate processed foods from the diet! In the video above, it is laid out perfectly on what this is and how to do it. Although I have been on a 100% raw food diet for 16 years now and that is my personal lifestyle choice. I’m not here to twist your arm into this lifestyle. You too can heal simply by following a whole food diet with the simple indication of eliminating processed foods, GMOs and refined sugars! If that’s too much for you to handle, it’s okay! Take baby steps as long as you head towards that direction. And eventually your body will move towards the healing process. Yes, I am saying you can eat chicken, turkey, eggs, dairy, raw foods, and cooked foods and experience healing. Discover what works for you and will keep you motivated to heal yourself. Everyone is different. I may be a madman and converted to a 100% raw food diet overnight, but that does not mean you need to do the same. I fully support everyone who desires to adhere to use whole food for healing (both cooked and uncooked). Even more so, I support those who need to take it slowly, yet are heading in the right direction. It is up to you how much and how fast you want to transition yourself into a full healthy lifestyle. I have compiled a list of whole food for healing that I believe will help you find the road to healing. Take a look at my approved whole food list below and print it out to carry with you, post on your refrigerator, or share with others! In fact, a good example of a delicious approved whole foods that have become the big thing in our store are the bean pastas, which are available in mung beans, adzuki beans, black beans, and soybeans. They are absolutely delicious and 100% organic and whole food approved from my list! It’s never too late. No matter how sick you feel or how old you are, there is always a new beginning. Today is your chance to take control of your health with these simple tools I have provided. Blessings on your new journey! Combining Rule: don’t mix animal protein with any starches such as baked potatoes, brown rice or other grains. In this exclusive guest editorial, Matt Monarch shares what he feels is the most critical part of a healthy diet, whether or not you are choose to live a raw food lifestyle (75% to 100%). Matt as been at the forefront of the Raw Foods Movement for over 18 years. He has worked with numerous clients, celebrities, nutritionists and doctors and has studied all of the alternative diets on the market today. He travels worldwide teaching about healthy eating and healing from degenerative diseases. Matt shares many different methods to help people heal, whether they want to follow a strict 100% Raw Food Diet or choose a simple cooked Whole Foods Diet. 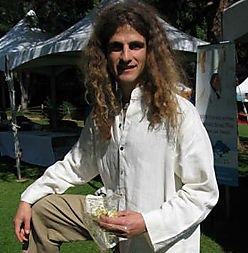 He runs one of the leading raw food websites, The Raw Food World.